In my vcf I have ./. 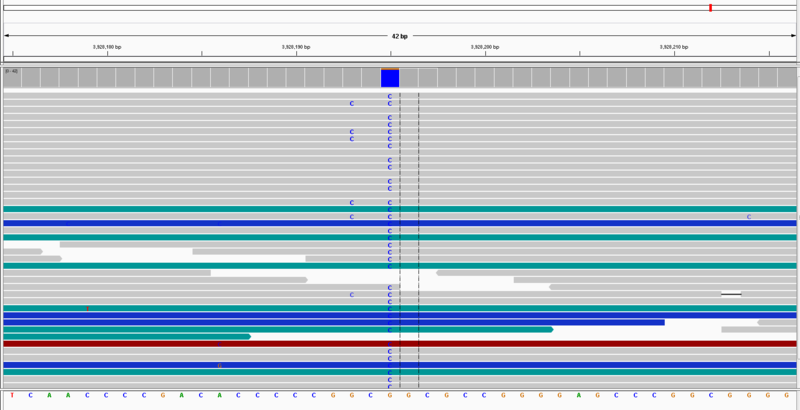 reported for some of the SNPs however I checked the bamout file and it seems like there should be a SNP there (40 reads, 36 for the variant, mapping quality mostly 60, base phred quality generally). Can you post an example VCF record and the corresponding IGV screenshots of the bam and bamout file? 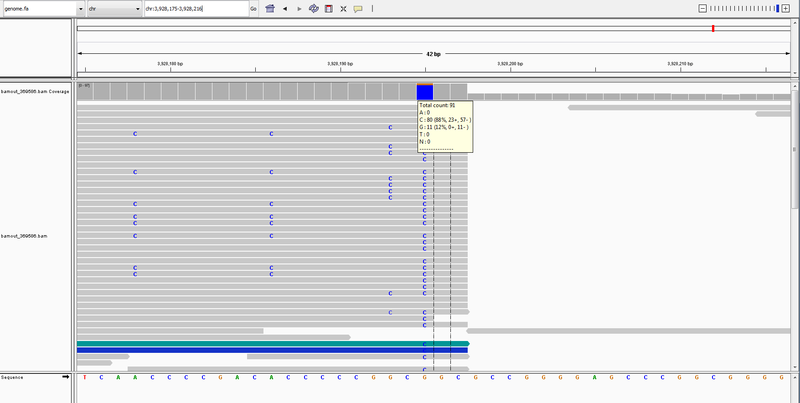 In IGV I'm looking at the first sample highlighted in the vcf and it's the position with all the Cs, at 3928195 bp. The number of reads in the bamout says 40, but this doesn't match the vcf if it's supposed to? What are the different colored reads? There are 11, and 11 is the number of reads missing in the VCF record. Can you post the GVCF record for the sample at that site? Red is for inserts that are larger than expected. Shades of green, teal, and dark blue show structural events of inversions, duplications, and translocations." I was thinking along these same lines when I originally saw this! Is there any further information I can send you to help understand what's happening? Thank you - that seems to have worked! I do have another question though - in other places I have the picture attached - a genotype has been called and the snp passes the filters but there doesn't seem to be any unfiltered reads supporting either the reference or the alternate allele, despite the DP? Thank you for the helpful article! Does this explain the discrepancy between the DP of 21 and seeing 91 i.e. they've been filtered out of the DP? 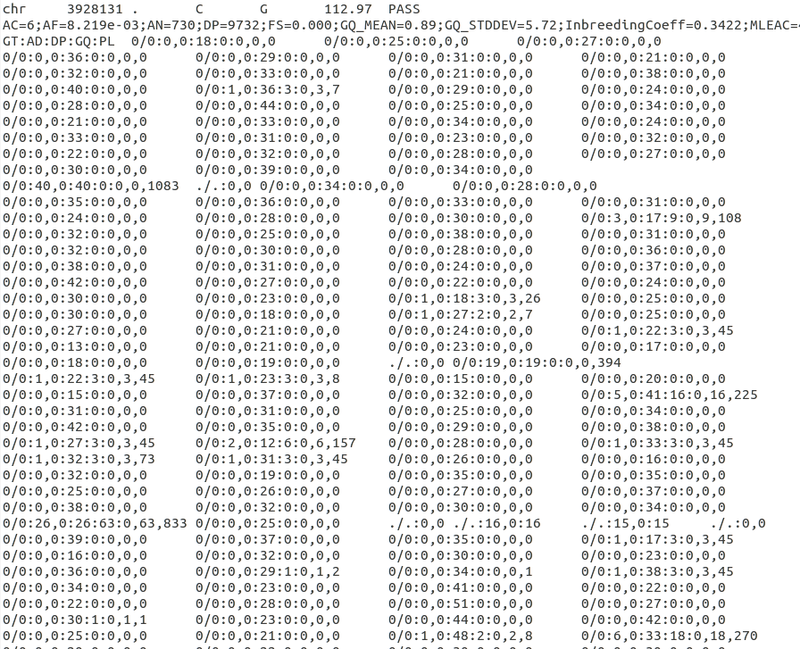 And in the case with the 0 AD should these variants be filtered ideally? Yes, the DP contains only the number of reads that were not filtered out. The AD contains unfiltered reads, but not uninformative reads. In your case, the region seems really messy, and the data cannot be trusted. We still use uninformative reads in the calculations, but the PLs tell you we do not have much confidence in the genotypes. Thank you for your help. Is it then possible to filter the variants using PL? No, you cannot filter on PL easily. However, you can filter on GQ. Basically, the GQ gives you the difference between the PL of the most likely genotype and the PL of the second most likely genotype. So, if you have a higher GQ, that is better (99 is the highest). In your case, all the PLs are 0, so the GQ will be 0, which is very low and will tell you we have no confidence in the called genotype. Hi @Sheila, Do you have any articles on filtering using GQ? Hi @Sheila, in that case will it work on a multisample vcf or does it have to be a variant-level aspect i.e. filtering on GQ_mean for the SNP? Also for the no call genotypes with some read support - they don't have a GQ value so it won't work to filter those....? It will mark any samples with a low GQ as the filter name you give it. I used the filtering you suggested, but was just wondering what to do with the Low GQ sites - should those samples have the site replaced with the reference or if it best to mark it as missing? Also I have the situation in the file attached and I was wondering whether it would be best to just filter that site? As for setting the genotypes to missing or reference, it really depends on what your end goal is. If you just want to filter sites and are asking if this site should be included, the best thing is to set it to missing. Can you tell me the exact command you used? That site should be filtered out. You can add the filter of DP == 0 to filter out that site you posted above.